ELEMENT offers the construction industry a complete range of Design-Build services including assistance with alternates and options, value engineering, fabrication and scheduling etc, all tailored to meet project requirements. Managing the Design / Fabrication / Delivery process is our core competency and is unique in the industry. This capability ensures consistent control over critical aspects of project execution; design, engineering, fabrication and delivery are all managed under one roof, thus dramatically reducing the coordination required on the part of the Contractor. Every project undertaken by ELEMENT is unique in the challenges presented. We tailor our process and strategy for every task. By approaching each project afresh and unhindered by previous thought, we are best able to provide simple clear solutions concerning all aspects of the delivery program. Through a set of proprietary processes, ELEMENT sets about building an execution plan that targets on time delivery and meets the quality and functional mandates set by the team. These processes has been developed and refined over many diverse projects and are demonstrably successful. The advantages to the Construction team is predictable risk reduction supporting project completion. 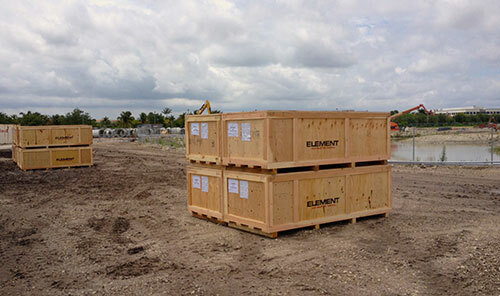 ELEMENT provides full technical support during the Preconstruction phase. From cost estimating through scheduling and installation advice, our skilled and experienced staff support Contractors’ efforts to mobilize for the construction phase. Our experience with complex custom architectural challenges has the breadth and depth needed to provide insight into what it will take to complete a project successfully. Often our services are called upon to assist in developing proposals that form part of a competitive bid process. On many occasions ELEMENT has been instrumental in securing a project by providing innovative solutions to design challenges. By thinking outside the box and providing samples and small scale mockups, ELEMENT supports competitive bids with solutions demonstrating design intent with significant cost or schedule benefits. Take a look at our case studies for examples. Typically, longer lead times exist in the provision of custom items and the standard approach to scheduling lacks adequate input to accommodate the additional work required. Similarly, cost overruns are a significant risk associated with non-standard items and, unless extremely accurate budgeting or adequate development time has been made available, additional contingencies in cost (and schedule) may be required. ELEMENT adds value by reducing schedule and cost risk if engaged early and our support during the Preconstruction phase is invaluable in this regard. Experienced and skilled staff, trained to think ahead and with the ability to plan and schedule wisely, are key to our success. Our project management staff assume ownership of, and control over, all aspects of project delivery from design development, engineering calculations, materials acquisition, fabrication, assembly and field liaison. This skill set enables ELEMENT to span multiple disciplines, bringing them together as a cohesive and seamless service to successfully deliver the Contractor’s needs. We understand the critical importance of delivering a project on-time and on-budget, and our depth of experience in dealing with custom architectural metalwork is reflected in our approach. 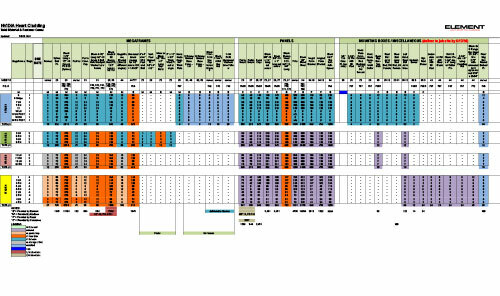 Since it is always the unknown unknowns that can create schedule and cost impacts when a project can least afford them, ELEMENT adopts a schedule strategy that anticipates these possibilities by planning on early delivery. We incorporate contingencies and work toward early delivery in order to create a buffer for unforeseen events. The majority of items provided by ELEMENT are required toward the end of the construction cycle thus affording little or no time for rework. Materials must be right first time. 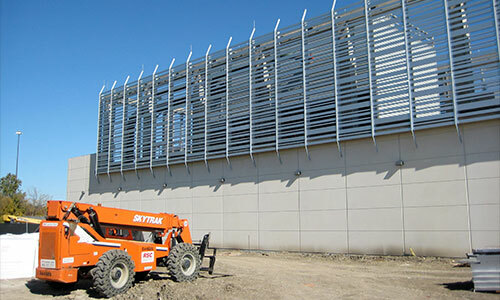 Ultimately, the fabrication and delivery of material to the job site is our central focus. 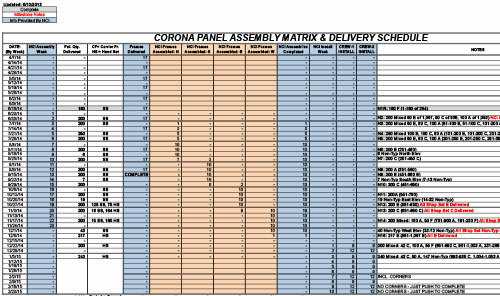 All fabrication is coordinated to meet the project schedule by being in advance of the project schedule. When creating unique custom components that have never been created before, the “Just-In-Time” approach is inadequate and every effort must be made to ensure time is available for corrective action or adjustment should the need arise. Early additional effort provides the maximum benefit to a project. 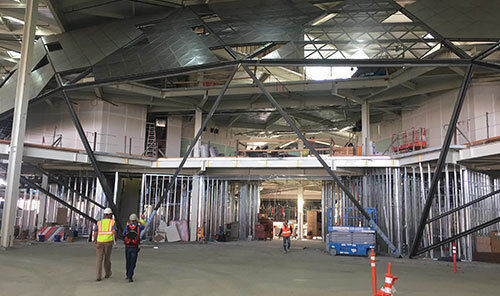 ELEMENT utilizes an extensive resource of fabrication capabilities, each of which is carefully chosen to mesh with the fabrication requirements of the project. Our sourcing of fabrication capabilities and equipment has taken us internationally when required. The flexibility inherent in our business model allows us to adapt to changing market conditions and project demands as required. This ensures we provide adequate capacity for the fluctuating demands typical of the Construction industry, while at the same time maintaining additional capacity from which we can draw when the need arises. Any project benefits when LEED principles are applied to materials sourcing and resource consumption. Often, suppliers to the construction industry utilize international supply chains that require significant amounts of travel to monitor production and quality. These also demand expensive and time consuming shipping and transportation arrangements that consume more energy and time than is necessary. These impacts are only amplified when site conditions require a small quantity of modified or replacement components and as a result, reality is sometimes counter to the intent of LEED. ELEMENT strives to deliver project materials without unnecessary or wasteful use of resources. We aim to source materials and fabrication as close to a project site as possible. Our goal is to utilize and retain as much capability as possible within the U.S. while being competitive with cost and delivery. This approach supports the intent behind LEED. Since every project is unique, every set of quality control parameters are unique and to this end ELEMENT develops and maintains project specific quality control programs. Issues with quality are never acceptable. Often there is little or no opportunity to remediate or redesign materials when they are needed on site. It is always important that quality parameters are established as early as possible. ELEMENTs’ focus on accurately determining those requirements is evidenced by inputs and suggestions made throughout the design phase. This integration of fabrication and design, specifically related to quality, is a core strength and key part of the ELEMENT value proposition. 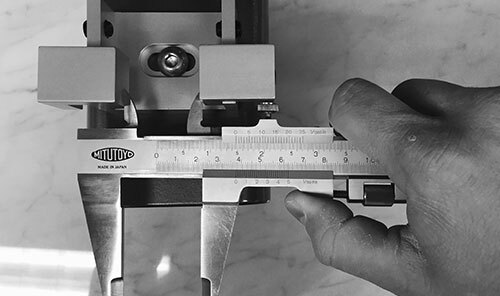 Our project management teams develop project specific QC programs tailored to the Clients’ requirements using years of fabrication experience. These programs cover all aspects of quality control from materials sourcing through step by step inspections of fabrication processes, all documented and presented to our clients at regular intervals throughout the fabrication and delivery process. 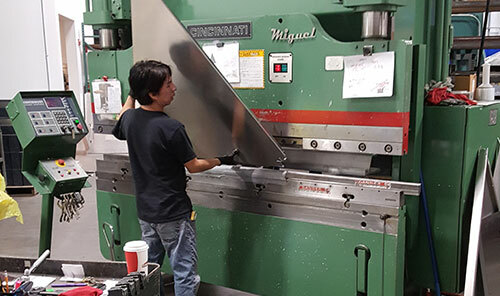 Occasionally, QC requirements may change during the mockup and testing phase and when his occurs, ELEMENT actively liaises with the team and their consultants to quickly and efficiently integrate these changes into a workable final program, prior to fabrication. The development and maintenance of accurate project schedules is critical to the successful execution of a project. Input from all team members is essential as early as possible. ELEMENT understands the need for reliable dates and predictable deliveries and we utilize modern online scheduling tools to provide immediate access to information from any location. We work with our Clients to develop schedules that are both realistic and contain contingencies for the unexpected. Unlike the purchase and delivery of standard “off the shelf” commodities such as HVAC equipment and day to day building materials, custom architectural metalwork often requires new processes that carry schedule risk. The lack of adequate design, engineering and planning and/or the omission of schedule contingencies can have a significant negative impact on the project. A thorough understanding of the challenges involved assures a sound knowledge base from which realistic schedules are developed. Site manpower is not only expensive but also a valuable and sometimes scarce commodity. Site resources, access to equipment, space limitations and numerous other logistical constraints all place heavy demands on delivery strategies. Sequencing of parts deliveries from off site storage is becoming increasingly common as ever larger projects are undertaken in dense urban areas. The development of project specific staging and delivery methods will support successful project delivery. By thinking outside the box, ELEMENT has proven its ability to drastically reduce shipping and installation costs. Take a look at Case Study one for an example. Click here. At no point throughout a project does it become more evident that the benefits of planning and forethought are critical to success, than at the time of installation. Shortcomings in the process up to this point quickly become obvious and carry the potential for adverse cost and schedule impacts. ELEMENT understands the critical importance of the building site; this is where all our work is put to the test. Installation conditions drive much of our design and engineering work in the early stages and we work diligently to ensure problems are identified and dealt with as early as possible. The sequencing and progress of other trades also impacts access to, and utilization of, site resources and we work with the construction team to facilitate seamless integration with job site workflow. Modern construction sites are often heavily constrained in terms of physical access and schedule. Developing an “installation centric” design to deal with these issues is a core strength of our team and an attribute proven time and again on many successful projects. From participation in pre-installation meetings through attendance on site during installation, ELEMENT supports the process by offering installation assistance on many different levels; for example, our LIDD package (Layout Information and Design Drawings) supplements our Shop Drawing and Engineering submittal and provides field personnel with the critical information required to successfully assemble and install complex structures.